pH is the general measurement unit for testing the acidity or alkalinity of water. For acidity, anything that is less than 7.0 pH is considered as acidic, while anything greater than 7.0 pH would be considered alkaline. It is important to know the exact pH measurements of your fish tank water and to research about the pH level tolerance of your fish. Neglect of these important variables can potentially cause your fish’s early death. How do pH levels affect aquarium fish? How often should I test aquarium pH? When you need to test pH for an established tank? How to reliably adjust aquarium pH? How to lower aquarium pH? How to raise aquarium pH? 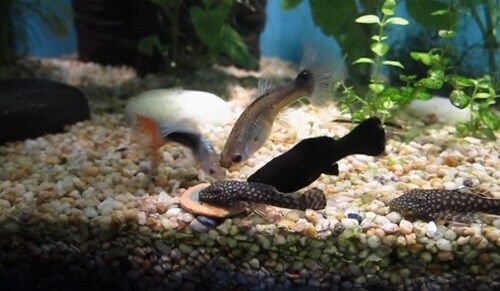 Depending on the origin, most freshwater tropical fish such as Tetra, Betta, Barb, Catfish, Bichir and Corydoras need a fairly well controlled water pH range that is between 6.5 and 7.0. In the other hand, Some fish such as Cichlids, Anabantids, Characins and Cyprinids prefer higher pH ranges to thrive. It depends on what the fish became adapted to in their native habitat. There are regions in South America where the water is very soft and acid – down to 5.5-6.0. There are other freshwater areas, such as in the rift lakes of Africa where the water is hard and alkaline, over 8.2. When dealing with marine fish, the salt water they have become adapted to is usually 8.4 or so. This wide range makes it very important to know what aquarium water pH value is required for the particular species you intend to keep. For the greatest fish comfort, you must select fish that are able to thrive in the particular pH reading you have in your aquarium. It is very costly in fish life to try to mix alkaline and acid loving fish together. For fish, it is vital that you keep the pH levels at a constant rate. They are most likely to get stressed by changing pH levels (for example, a water pH level that constantly shifts from 6.6 to 7.0) even if it’s suitable for the fish’s pH tolerance levels. This doesn’t mean that you should get it at any exact constant point, though that would be very difficult. Just keep it at a very low pH swing rate, something at around 0.2 unit change in pH levels should already be tolerable enough for your fish. pH is possibly the most important water characteristic since it interacts with a number of others. The other main compound that pH can influence is the toxicity of ammonia. When the water is low in the pH scale (below 7.0) and acid, the predominant ammonia compound is ammonium (NH4+). This is quite safe. On the other hand, when the pH is above 7.0 and more and more alkaline, the concentration of ammonia takes over and the water can become quite deadly to fish, even in very small amounts. If you don’t sure about the quality of the tap water source in your area, give it a first pH test. Make sure that the water you use is in an acceptable range for fish to live in. The pH of the tap water will change upon using as aquarium water because many decorations (stones, driftwood…) and substrates can affect the pH level. It is advised to leave a new setup tank for at least 24-48 hours before testing pH to get a reliable value. Leaving the water for a week before testing works best, although it is indeed a bit time consuming. Because the pH levels of a new tank are not stable as cycled tanks, you should do a pH test every two days if you cycle your tank with some stater hardy fish, or once or twice a week if you use a fishless cycle method (using fish foods or ammonia sources.) Repeat the works until the Nitrogen cycle in the tank is established (reading zero in ammonia and nitrite). The pH level in an established aquarium depends on many factors. But generally, it does not change if you do not put any new variables into the tank. The pH level of an established tank is fairly stable and only need to be tested once a month. The pH level will occasionally need to be tested if you notice that the fish or aquarium plants are not growing or feeling well. There are so many causes that make aquarium fish do not look well and the adverse changes of pH can be a reason. You also need to test pH levels after adding new decorations, rocks and driftwood into your aquarium. If you apply something into your aquarium to adjust the pH level, it is advised to test the actual pH again after the process. Nowadays there are many ways to measure the pH in the aquarium. The most common ways are pH test kits and test strips as well as pH testers. All these equipment can be purchased from the aquarium shops as well as ordered from online stores. One way to measure pH in the aquarium is using pH test kits. 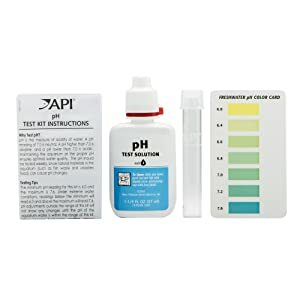 API pH test kit is a reliable one you can use for your freshwater aquarium. The kit is capable of measuring a neutral pH range from 6.0 to 7.6. If your tank is saltwater or alkaline freshwater that has pH levels over 7.4, you should use an API high range pH test kit . 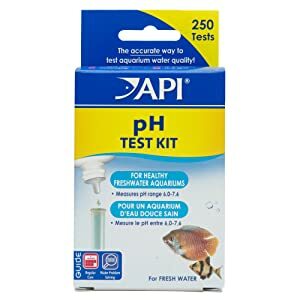 The API pH test kit is ideal for determining the pH of freshwater aquariums. It helps to monitor the aquarium pH and prevent invisible water problems that can occur and harm the fish. The kit itself contains 1 bottle of testing solution, 1 color card that is used for evaluating the pH value and 1 glass test tube with cap. How to use the API pH test kit? Firstly, you need to fill the testing tube with 5 ml of aquarium water. Then add 3 drops of the pH testing solution into your water sample in the test tube. To assure uniformity of the drops, you should hold the dropper bottle upside down in a completely vertical position. Cap the test tube and shake it well so that the solution is properly mixed with the aquarium water. And finally, go to a well-lit area and compare the water sample color to the color card that indicates the specific pH of each color. With the use of this kit, you have a chance to control the pH of your aquarium and avoid fish loss by sudden pH changes. There are no restrictions in use, but it is advised to use the kit weekly and when aquarium water problems are visible. Remember to rinse the test tube with clean water after use. The third and the most know-how way of measuring pH is to use a pH meter. Vantakool Digital pH meter is an accurate one recommended for you. It is highly accuracy and used widely in everyday life. This tester has a sensitive electrode sensor for reading precise pH levels. 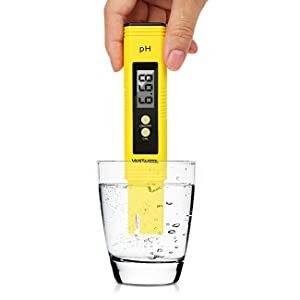 To use the pH meter, it is needed to remove the protective lid and put the pH meter electrode in the aquarium and just press the start button. The pH levels will be shown on an LCD display. This pH tester is powered by batteries and has a calibration function for accurate measurement. 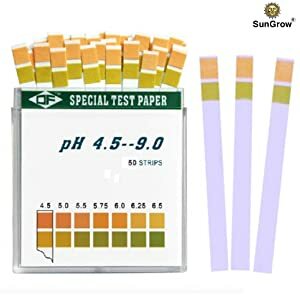 The other easy option for defining the pH is the use of pH test strips. They are very easy to use with no complicated setup required. They are able to change color according to the pH of test water. With these strips, it becomes possible to ensure that the water is not over alkaline or acidic and your fish fall ill. 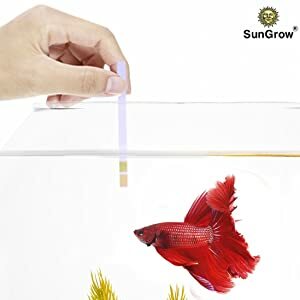 The SunGrow pH test strips are fairly cheap and very easy to use. Firstly, take a small amount of aquarium water to do the test and place a strip inside the water. Ensure that both colored sections of the strip are covered with the water. Wait for 2 seconds until the colored sections of the strip change their colors. 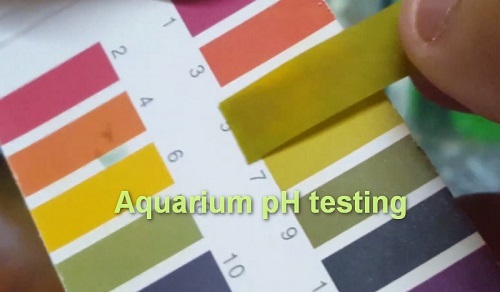 Now, you can determine your aquarium pH by comparing the colors of the strip with the pH color scale. You have to know that the aquarium water has a buffering capacity, which is the ability to resist any change in pH levels. Water hardness creates a buffering effect on pH. The harder the water, the more difficult to change the pH since the hardness adsorbs the acid or alkali with no apparent result. People in a great hurry often find that the pH will not change after quite a number of doses of a pH modifying product. The natural buffering of the water accepts all the compounds with no visible effect. Then, suddenly just a little bit more added overcomes the buffer capacity, the pH dives or rises dramatically. Most aquarists are also disappointed to find that after a few hours of adjustment the pH returns back to where it was originally. The process needs to be done again (and again). So, the true and scientific way to reliably change the aquarium pH is to change its buffer level but not the pH. 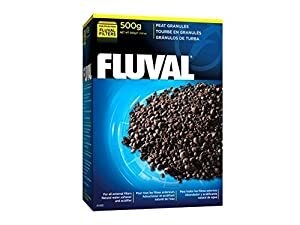 In planted aquariums, many plants and fish, especially blackwater species like Tetras, prefer water at slight acidic pH of around 6.5 or less and you need to add something to lower the pH. Peat and driftwood are commonly used in this situation. When added to the aquarium, they release many organic compounds to the water and change its natural buffer ability from supporting neutral pH to acidic pH, thus lowering the pH. 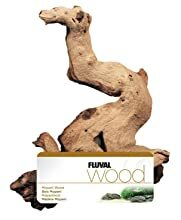 Peat is usually added to the filter while driftwood is used as hardscape for aquascaping. Add a little peat to your filter daily until the water gets the pH you want. Commercial products like Seachem Acid Buffer is also a great option instead of peat and driftwood. Use 1/4 teaspoon (2g) of the buffer for every 20 gallons of water daily until achieving your desired pH. You can add the buffer directly to your tank or filter. If the pH of your tap water is different from the aquarium pH, once water change, prepare changing water with Seachem Acid Buffer in a separate bucket, then add it to your tank. Unlike species in planted aquariums, cichlid and saltwater species require alkaline water to thrive. 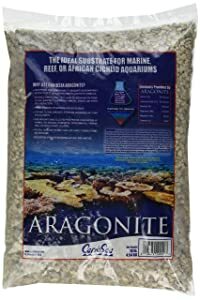 Crushed coral is well known to buffer the aquarium water at an alkaline range. It can be used as the aquarium substrate or added to the filter to raise pH levels. Add a little crushed coral daily until your desired pH is reached. Commercial products like Seachem Alkaline Buffer is also a great option instead of crushed coral. Use 1/4 teaspoon (2g) of the buffer for every 20 gallons of water daily until achieving your desired pH. You can add the buffer directly to your tank or filter. If the pH of your tap water is different from the aquarium pH, once water change, prepare changing water with Seachem Alkaline Buffer in a separate bucket, then add it to your tank. Why prepare tap water with aquarium conditioners?